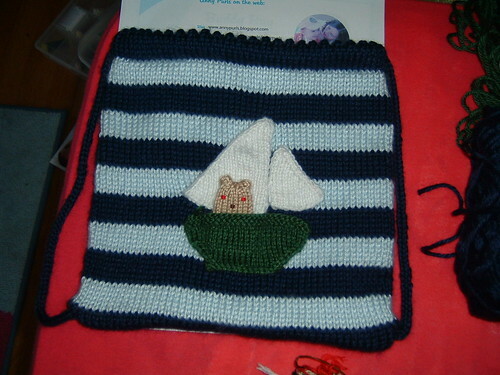 Buddy Bag, originally uploaded by Craftydiddl. Wow Guys-it has been awhile. I feel a lot better thank you so much for your well wishes! i have a small cough still and i did pass the cold on to Little Man. i was more physically wiped out from the cold the first few days, Little Man seems to have more cough than me but we are all doing good. yay!! So what have i been up to before and after my cold? Knitting and sewing!! First-The Buddy Bag that i have at the beginning of the post. it is a cute little backpack for Little Man to take with us when we go shopping or on little trips. It’s the perfect size for a snack and a toy and he always likes to take something or help me so i know he will enjoy it. I just finished it this afternoon and it wasn’t until i took the pictures and saw them on my computer that i noticed the Bear Finger puppet looks slightly Evil with his red eyes LOL-he really looks much cuter in person. anyway on to the details. Yarn: Bernat Satin-i bought the Dk. Blue, Lt. Blue and White. I used leftovers for the green on the boat and brown for the bear. Overall it is a fun and easy pattern. I did make the bag a little wider by adding 20 more sts. Other than that all is as written. I also still need to line the inside of the bag-probably tomorrow or Friday. Your probably like “Okay i thought there was some sewing.’ There was!! i made a purse!!! i love my purse and already have fabric cut for the next one. Even though i have lots of buttons-none were large enough so must go to the craft store. The pattern is from here. I got the fabric 3 years ago when i had my grandma make me a knitting tote and needle roll. We really bought a lot of fabric-so lots left over. I am not complaining means i didn’t have to buy any. I love that fabric!!! So i am better, i have been productive and i hope to be back to some regular posting! You made a very cute backpack and yes, the bar looks a bit evil, that’s funny! ^^ And the purse – I love the outer fabric and the way the lining is two toned, great job! WOW! You’ve been busy and had a cold. I don’t know how you got it all done! The Buddy Bag is so cute. Little Man must love it. The socks for your husband are coming out great. Your new purse is wonderful. The colors are beautiful and I love the way you did the lining. CUTE bag!! Haha! Just love it for Little Man! VERY nice anniversary socks! Well look at it this way the gift hadn’t been reveal completely! So are still good to go! Unless you already spilled the cookies it was for him?? Okay I didn’t know you could sew woman!